The Pennsylvania Railroad's 52 T1 class duplex-drive 4-4-4-4 steam locomotives, introduced in 1942 (2 prototypes) and 1945-1946 (50 production), were their last steam locomotives built and their most controversial. They were ambitious, technologically sophisticated, powerful, fast and distinctively streamlined by Raymond Loewy. However, they were also prone to wheelslip both when starting and at speed, complicated to maintain and expensive to run. The PRR vowed in 1948 to place diesel locomotives on all express passenger trains, leaving unanswered questions as to whether the T1's flaws were solvable, especially taking into account that the two prototypes did not have the problems inherent to the production unit. An article appearing in a 2008 issue of the Pennsylvania Railroad Technical and Historical Society Magazine showed that inadequate training for engineers transitioning to the T1 may have led to excessive throttle applications, resulting in driver slippage. Another root cause of wheelslip was faulty spring equalization. [jargon] The drivers were equalized together and not equalized with the engine truck. In the production fleet the PRR equalized the engine truck with the front engine and the trailing truck with the rear engine, which helped to solve the wheelslip problem. PRR T1 #6110, one of the two prototypes of Class T1. Its streamlined casting was designed by renowned industrial design Raymond Loewy, with details different from the 50 production engines. Before the T1, the last production express passenger engine the PRR had produced was the K4s of 1914, produced until 1928. Two experimental enlarged K5 locomotives were produced in 1929, but they weren’t considered enough of an improvement to be worthwhile. After that the PRR's attention switched to electrification and the production of electric locomotives; apparently the railroad decided that it had no need for more steam locomotives. But the deficiencies of the K4s became more obvious during the 1930s. They were fine locomotives, but as train lengths increased they proved to be underpowered; double headed K4s locomotives became the norm on many trains. The railroad had many locomotives available, but paying two crews on two locomotives per train was expensive. Meanwhile, other railroads were leaping ahead, developing increasingly powerful passenger train locomotives. Rival New York Central built 4-6-4 Hudsons, while other roads developed passenger 4-8-2 "Mountain" types and then 4-8-4 "Northern" designs. The PRR's steam power began to look outdated. The PRR began to develop steam locomotives again in the mid-to-late 1930s, but with a difference. Where previous PRR locomotive policy had been conservative, new radical designs took hold. Designers from the Baldwin Locomotive Works, the PRR's longtime development partner, were eager to prove the viability of steam in the face of new competition from Diesel-electric locomotives. They persuaded the railroad to adopt Baldwin's latest idea: the duplex locomotive. This split the locomotive's driving wheels into two sets, each with its own pair of cylinders and rods. Until then the only locomotives with two sets of drivers were articulated locomotives, but the duplex used one rigid frame. In a duplex design cylinders could be smaller and the weight of side and main rods could be drastically reduced. Given that the movement of the main rod could not be fully balanced, the duplex design would reduce "hammer blow" on the track. The lower reciprocating mass meant that higher speeds could be achieved. Use of poppet valves also increased the speed because they gave very accurately timed delivery of steam to the cylinders. However, there was a drawback of the metallurgy used; the poppet valve could not withstand the stress of sustained high speed operation (meaning over 100 mph (160 km/h) on production T1s). The first PRR duplex was the single experimental S1 #6100 of 1939. It was powerful and managed to reach 100.97 miles per hour (162.50 km/h) on level track with 1350 tons passenger stock behind her. Its performance encouraged the PRR continued to develop duplex steam locomotives. The S1 was built unnecessarily large for her exhibition at the 1939 New York World's Fair until October 1940, therefore its turning radius prohibited it from operating over most of the PRR network. The 6-4-4-6 design reduced driving set traction to the point that it was especially prone to wheel slip, thus only one Class S1 was built. The PRR returned to Baldwin to develop a duplex design fit for series production. Two Baldwin prototypes (#6110 and #6111) were ordered by the PRR at a cost of $600,000 in June 26, 1940. Both prototypes had numerous teething problems and were prone to wheelslip if not handled carefully by the engineer. But favorable test reports resulted in a production order for 50 T1s, split between the PRR's own Altoona Works and Baldwin. On Dec 20, 1944 the PRR Board authorized the purchase of 50 Class T1 locomotives for $14,125,000 ($282,500 per unit). Baldwin's chief designer, Ralph P. Johnson, was responsible for the mechanical aspects of the new T1 class. Designer Raymond Loewy obtained US Patent D 136,260 for an early T1 conceptual design with a high-mounted cab located over the forward driving set. 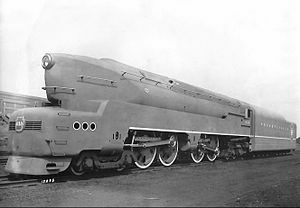 While that suited Baldwin's objective of making the most distinctive steam locomotive possible, practical considerations led the T1 design to be revised to the conventional cab position with a slight modification of the unique nose design included in Loewy's patent. The last production T1 (#5549) entered service on August 27, 1946. The T1 was fitted with the PRR passenger locomotive standard 3 note whistle. Engine #5539 developed 5,012 hp (3,737 kW), as tested between September 11, 1946 and September 14, 1946 by Chesapeake and Ohio Railway dynamometer car DM-1 while on loan to C&O. In 1944 #6110, tested on the Stationary Test Plant in Altoona, developed 6,550 hp (4,880 kW) in the cylinders at 85 mph (137 km/h). Due to their complexity relative to other steam locomotive designs, T1s were known to be difficult to maintain. Recommended to a maximum speed of 100 miles per hour (161 km/h), T1s were so powerful that they could easily exceed their designed load and speed limitations, which in turn often caused wear and tear issues. A technician charged with determining the cause of frequent poppet valve failures on the T1s claimed to have observed them being operated at speeds of up to 140 mph (225 km/h) to make up time. The T1 was designed to run reliably at speeds of up to 100 mph (160 km/h). Although such reports are viewed as dubious, some think T1s regularly exceeded 100 mph (161 km/h), making them among the fastest steam locomotives ever built. The price paid for such speed was higher maintenance costs and increased failures in service. The T-1 4-4-4-4 was so powerful that violent wheel slip over a wide speed range could occur if the throttle was not handled carefully by the engineer. Loss of driver traction at high speeds, especially when the T1 was under heavy load while ascending grades, caused damage to the poppet valves. They were described as "free steaming", meaning they could maintain boiler pressure regardless of throttle setting. A T1 prototype leaves Chicago's Union Station in February 1943 with the Manhattan Limited to New York. Most T1s were degraded to power secondary train when the PRR Board decided to dieselize all first class prime train in 1948. Some of them were withdrawn from passenger service as early as 1949. All of them were out of service by 1952. All T1 locomotives were sold for scrap between 1951 and late 1955. The last engines were towed westward for scrapping in early 1956. However, an exact scale live steam replica in 1 inch/foot scale (1:12) has been built by Ed Woodings, using the original T1 plans. In addition, the T1 has proven a fairly popular subject to be reproduced in model form. A rather loose version of a PRR T1 also appeared in the 2004 film Lemony Snicket's A Series of Unfortunate Events. A non-profit group known as The T1 Trust plans to build an all-new, fully operational T1 using the original plans with subtle performance improvements where necessary. The T1 Trust's goal is to provide mainline excursion service and to set the world speed record for a steam locomotive currently held by the LNER Class A4 4468 Mallard at 126 mph. It is worth mentioning the original T1s were reported to have broken Mallard's speed record as far back as 1948, but these claims have never been officially confirmed. The T1 Trust's cost estimate to build T1 number 5550 is $10 million with an expected completion date of 2030. The construction of 5550 is also following construction and financing methods pioneered by the LNER Peppercorn Class A1 60163 Tornado project. The first piece of the locomotive, the keystone shaped number plate, was cast in April 2014, followed by the first minor component, a driving spring link pin, in October 2014. The headlamp was constructed and given to The T1 Trust by a donor in mid 2015. On February 26, 2016 the first driving wheel for 5550 was cast. The massive and complex Boxpok driver weighs 2,500 pounds. In October 2016, construction began on the iconic prow of the locomotive using aircraft grade aluminum framework and plating. On January 18, 2017, the first frames for the cab of 5550 were cut and prepared for assembly. Similar to the prow, the cab frames are made of aircraft grade aluminum. The second Boxpok driver, originally ordered on December 9, 2016, was delivered to the Trust on March 15, 2017. The prow and cab were the next items to be completed in May and July 2017 respectively. A Coast to Coast tender from a former M1 class Mountain 4-8-2 was bought in August 2017. As of May 4th, 2018, some progress has been made on the tube sheet and 3 boiler courses are on order. South Australian Railways 520 class, an Australian locomotive with similar streamlining style. ^ a b Staufer 1962, p. 217. ^ Staufer 1962, p. 225. ^ a b c d e f "FAQ Section - The T1 Trust". The Pennsylvania Railroad T1 Steam Locomotive Trust. 2016. Retrieved 23 April 2017. ^ Reed 1972, p. 271. ^ Reed 1972, p. 275. ^ a b Llanso, Steve; Duley, Richard. "Pennsylvania 4-4-4-4, 6-4-4-6, etc. "Duplex Drive" Locomotives of the USA". SteamLocomotive.com. Retrieved 23 April 2017. ^ "Pennsy T1 comeback? Ten questions and answers for the T1 Trust", Volume 75, Number 5, Trains Magazine, May 2015. ^ "Streamlimed Locomotives of the Swing Era". Retrieved August 20, 2016. ^ Rivanna Chapter, National Railway Historical Society (2005). "This Month in Railroad History: August". Retrieved 2006-08-25. ^ Reed 1972, p. 279. ^ Noble, Bradford (4 May 2016). "SOLIDWORKS is Helping Build the World's Fastest Steam Locomotive: Part 1". The Solidworks Blog. Retrieved 24 April 2017. ^ "Railway Vehicle Information Sheet - 1975-7007 - Mallard". National Railway Museum Official Website. York England: National Railway Museum. p. 3. Retrieved 9 May 2017. ^ "Latest News - The T1 Trust". The Pennsylvania Railroad T1 Steam Locomotive Trust. 2014–2017. Retrieved 23 April 2017. Staufer, Alvin (1962). Pennsy Power. Staufer. pp. 216–225. LOC 62-20872. Brian Reed (June 1972). Loco Profile 24: Pennsylvania Duplexii. Profile Publications. Wikimedia Commons has media related to Pennsylvania Railroad T1. Chesapeake & Ohio Tests the PRR T1 - Chesapeake and Ohio Historical Magazine, May 2005 by Stephenson, David R - The C&O test report contains information that is not widely known, and some of it contradicts generally accepted beliefs about the T1. YouTube video displaying the operation of T1's on the Pennsylvania Railroad - At 3 minutes and 15 seconds, an example of the T1's infamous wheel slip can be observed.